Marijus Šmigelskis opened one of the prize projects at Easter Island at Redhill. The line, "Storefront Cemetery" climbs along the prow of a roof and then moves round onto the face for the crux. The grade is somewhere around 7C+ or 8A and future repetitions will decide. 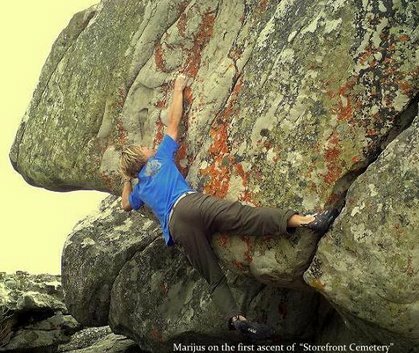 Marijus then visited The Lookout in Topside and made fast work of "Fit Birds", a 7C campus problem opened by Jerry Moffat a few years ago, before moving to boulder M and dispatching the roof project. This new problem, "Adult Swim" 7C, climbs out a small cave via little crimps to a wild cutloose crux off good sloping holds that face the wrong way. Julia Chen also made a visit to Easter Island and managed fast sends of "The Brown Eye of Ra" 7A+ and "Insane in the Duane" 7A, both in a single session on the same day.